Chiricahua National Monument is located in the mountains Chiricahua and is renowned worldwide for the specific rock formations that rise up high there. The monument is located near Willcox, Arizona. Here is what is left after the eruption of a volcano that has profoundly shaken the region around twenty-seven million years ago. This eruption is known as the eruption of the Turkey Creek Caldera. After the volcano erupted, the surroundings are covered with a huge amount of volcanic ash. It contains silicon, which hardens and has turned into a strange mass, eroded to a form, which is familiar to tourists who come here from around the world. Chiricahua National Monument was established in 1924. Tourists are stunned by the sight of some of the most beautiful rock formations that can be seen. The road that leads to the rocks, allows only walking, access to motor vehicles is limited. In the area come many people who want not only to enjoy the view, but to use the famous climbing routes. 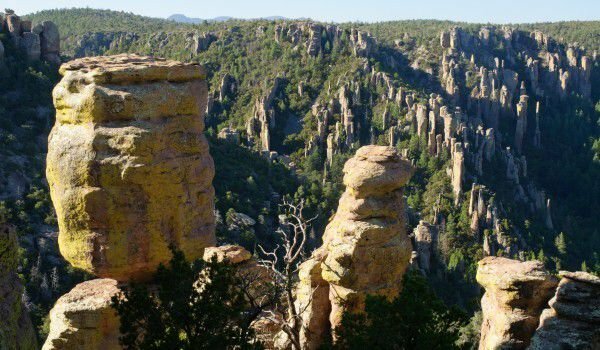 Chiricahua National Monument stretches over eleven thousand acres. The Historic Site of Faraway Ranch shows visitors how the inhabitants of the area have lived here many years ago. On the eighth May 2011, a giant fire arose from the eastern mountains of Chiricahua and continued to move on, until in the beginning of June, it reached the national monument Chiricahua. The fire wiped out the southeastern corner of the park. After assessing the damage caused by fire, known as the Horseshoe Two Fire, it was discovered that the flames turned two hundred twenty-three thousand acres in the mountains Chiricahua to ash. Fortunately none of the rock structures within the national monument Chiricahua were damaged by the fire. Although the fire has wiped much of the greenery of the park out, there are many places that are green and are sources of water. Experts say the effect of fire is yet to increase. Therefore, visitors are guided by park staff on how and what to do. The territory of national monument Chiricahua has amazing birds and animals. Species that inhabit the green meadows, those who inhabit the desert and the mountains make Chiricahua their common home. The western box turtle feels perfectly at home within the national monument. Black bear and white-tailed deer wander undisturbed within the monument too. The rock formations are perfect for snakes, so the rock rattlesnake prefers the national monument Chiricahua to many other places. The Turkey Vultures create their nests on the rock formations. Plenty of water creates wonderful living conditions for tiger salamanders. The fox squirrel is common within the monument Chiricahua. Migrating birds pass through the area when trying to escape from the windy places in Mexico. There are many species that remain within the monument at different times of the year. A total of about two hundred bird species inhabit the monument at different times of the year. The unique geographic location of the monument makes it ideal for habitation of seventy species of mammals, forty-six types of Reptilians and innumerable different types and sizes of insects.